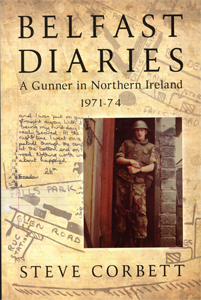 The Gunner’s notebooks detailing his two tours of duty – Andersontown, November 1971 – March 1972, and New Lodge June 1974 – October 1974 – were put in a drawer where they were to lay, untouched, for more than 30 years. His account of his service is vividly brought to life and validated through newspaper articles, intelligence reports, and surviving examples of IRA propaganda. In the four-month period during 1971 that Gunner Stephen Corbett was stationed in Andersontown, Northern Ireland, 33 servicemen were killed by terrorist action in the province. His unit, 9 (Plassey) Bty, Royal Artillery, was attacked by a bomb, bullet or rioters on more than 400 occasions. In 1972 alone, the toll of service personnel killed was more than 100. Yet their action was never classed as a war. When the servicemen returned home there were no marches through the streets to cheering crowds. They just quietly slipped in unnoticed and carried on with their other duties.’Belfast Diaries’ offers a unique opportunity to see this conflicted city through the eyes of an serviceman charged with peace-keeping duties at the height of ‘The Troubles’; a real ‘must-read’ for any Northern Ireland or British Army enthusiast. Especially rare are the large collection of photographs taken by the author at that time, illustrating the life of a serviceman both on and off duty.